Is this Omar Khayyam ….. or not? Garry Garrard poses an intriguing question. 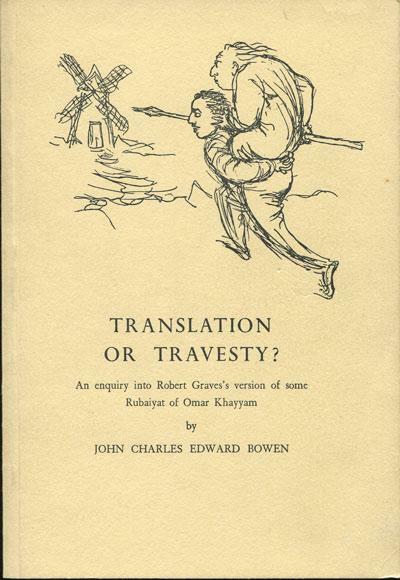 Is this Omar Khayyam ..…. or not? What do you think of this verse? A cooling Wine-jar for the inn. The fact that it’s not a Rub’ai immediately gives the clue that it isn’t by the old tentmaker. But how Khayyam-ish in its imagery! I came across it in The Golden Pomegranate, a book of Mogul poetry translated by JCE Bowen. The original poem was by Sa’id, (1605-1677) born in Isfahan and active in Mogul India. He also wrote in Turkish and his reputation is evidently high in both India and Turkey – but not Persia/Iran. Had he read Khayyam? It seems as if most of his work and images are quite innovative. ornate and fairly expensive (the first one I saw at a bookfair was £300, but it was owned and signed by Lawrence Olivier.) The text is available in a cheaper version published by John Baker in 1966. Set out for you enthusiasts to taste. Before your final resting place is dug.